Last night at dinner we got to know Michael and Lorna from Aberdeen, Scotland. They flew over for the weekend to attend TrawlerFest. They have purchased a 75 ft wooden fishing boat in Scotland and will either restore it and sail it across the Atlantic or buy an equivalent boat here. They want to do the Great Loop and attended my talk to learn more about it. Michael told us that there are hundreds of Duthies that live in Aberdeen. Today we drove 240 miles to Freeport Maine, the home of L.L. Bean. It seems the entire town has been turned into a monster outlet mall with quite a few high class brands represented in addition to Bean. It is very well done with lots of parking. The huge L.L. 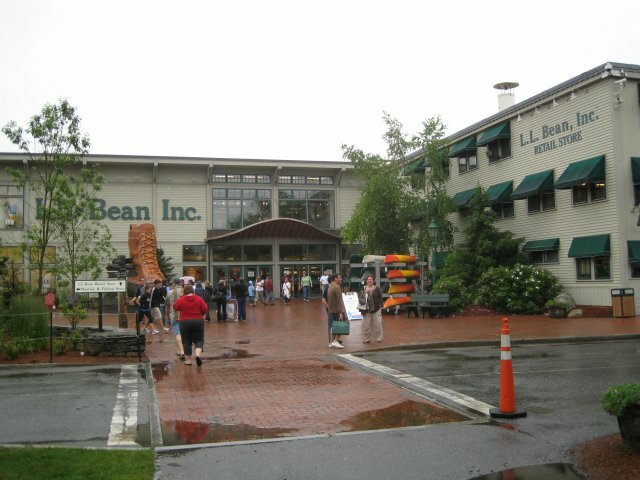 Bean store has lots of helpful clerks and we left a little poorer with new hiking boots. Tonight the iPod is playing with our own tribute to Michael Jackson; 7 selections from Dangerous. Our next stop tomorrow is Acadia National Park.